Looking for a cabin that sleeps 14 guests in the Smoky Mountains? 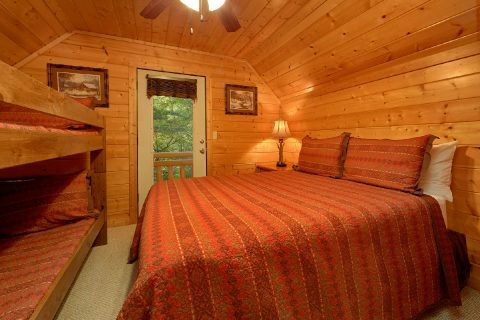 Come experience "Deer To My Heart," a lovely 5 bedroom cabin that can easily accommodate up to 14 guests! 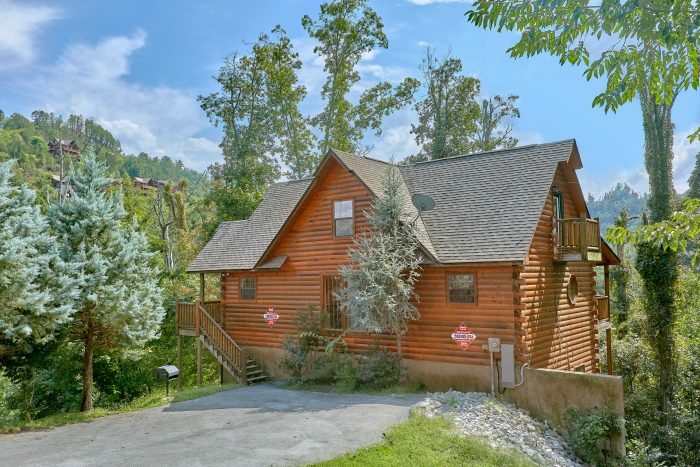 Not only does this spacious cabin have everything you need for a fun family vacation, but it also boasts a prime location that's only 7 miles from the Pigeon Forge Parkway. 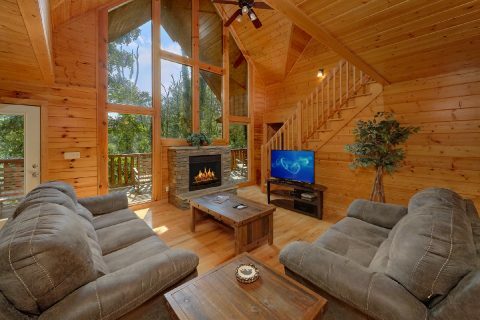 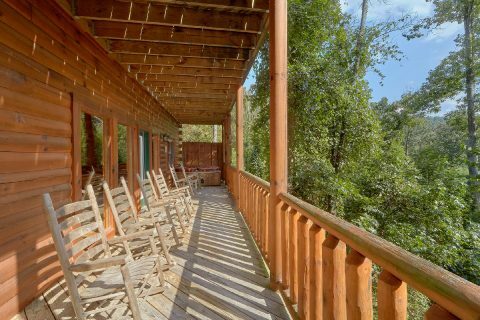 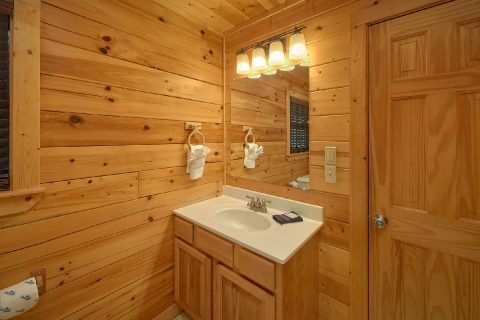 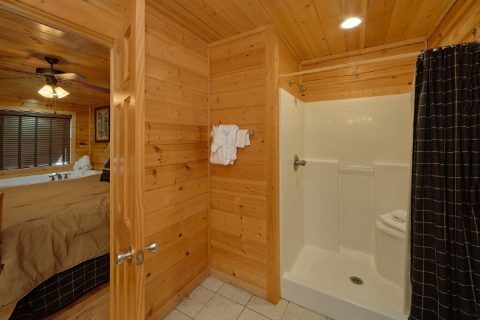 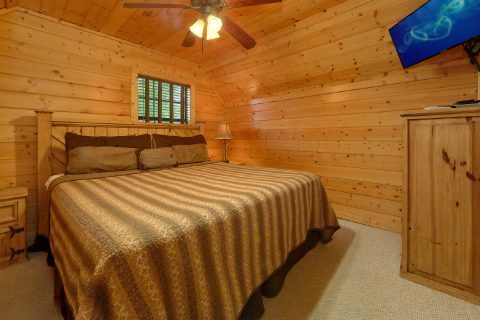 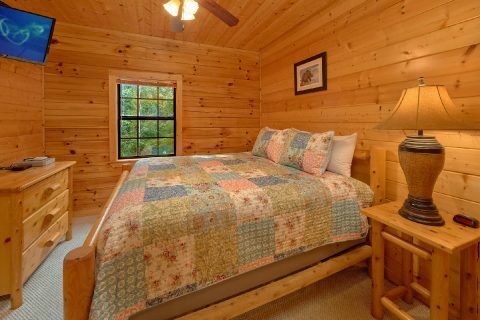 When you aren't busy exploring fun local sights like Dollywood, The Island, or The Historic Old Mill, you'll love unwinding at this comfortable cabin in the exclusive Hidden Springs Resort area. After a great day in the mountains, you can always unwind at the resort swimming pool or you can enjoy a soothing dip in the privacy of your cabin's outdoor hot tub. 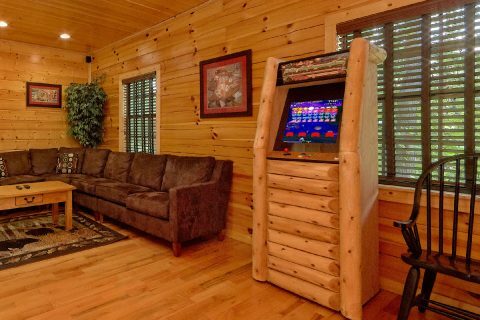 Inside, you'll find an inviting living room on the main level complete with an electric fireplace, a sit-down arcade game, and a television. 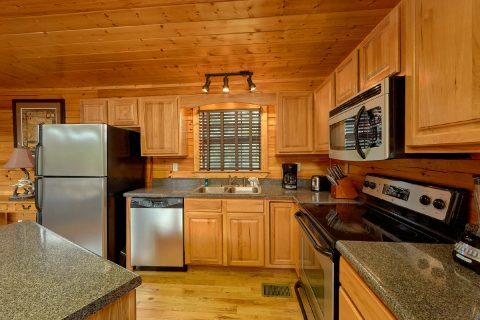 For enjoying delicious meals in the comfort of your cabin, you can make use of your in-cabin kitchen or you can fire up the outdoor charcoal grill for your very own cookout in the Smokies. 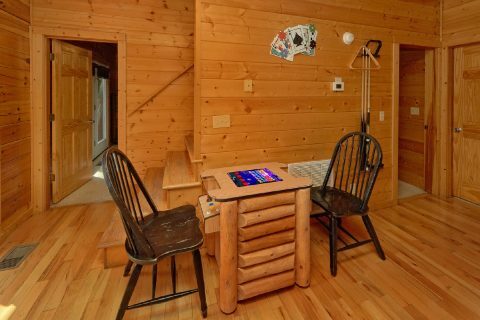 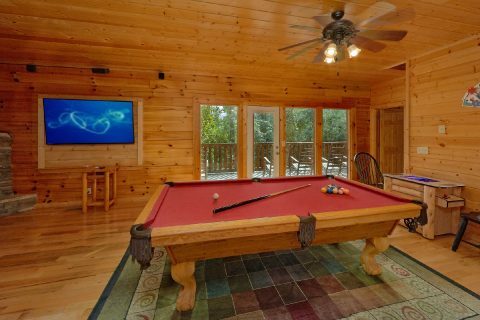 For some fun and relaxation, you can enjoy a friendly game of billiards on the pool table or the stand-up arcade game in your cabin's downstairs game room. 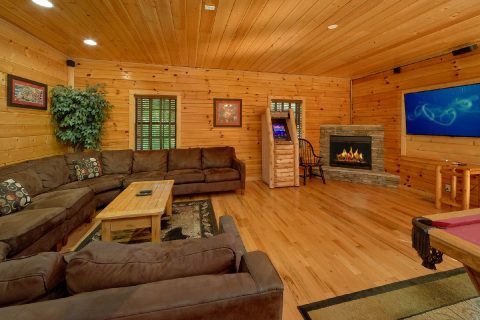 There's also a nice media area complete with a large sectional sofa and a 65" television. 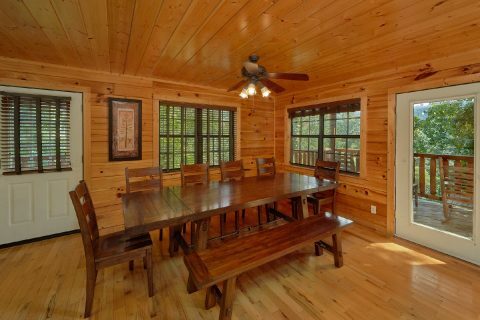 To enjoy your cabin's forested setting, simply step out onto the deck to sit out in the fresh mountain air. 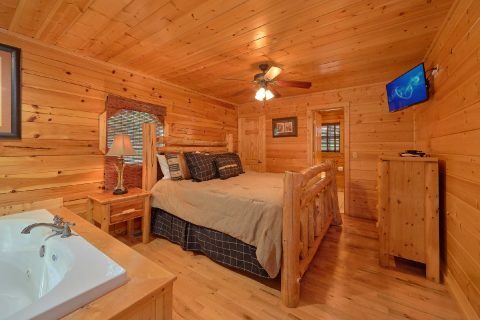 Once it's time to get some rest, you can look forward to sleeping in one of your cabin's 5 bedrooms. 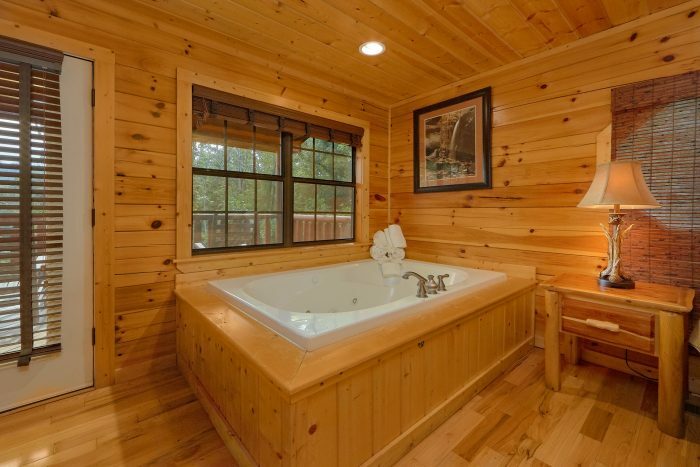 On the main level, there is one king bedroom that features a jacuzzi tub. 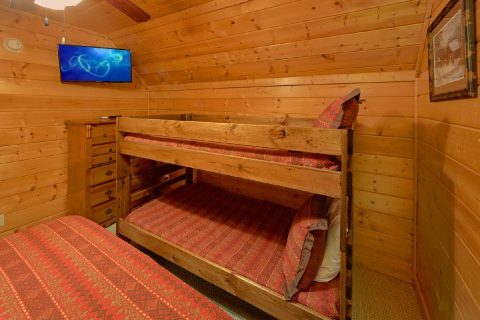 Upstairs, you'll find another king bedroom and a queen bedroom that also has twin bunk beds and a private balcony. 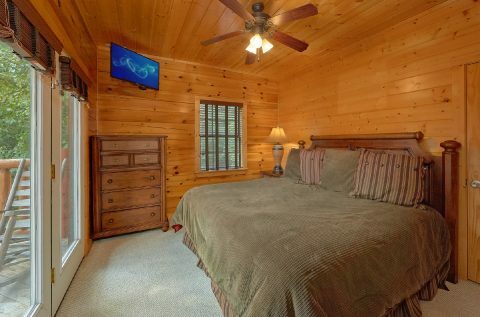 Downstairs, there are two more king bedrooms and the main level living room features a sleeper sofa, so this rental can easily sleep up to 14 guests with ease. 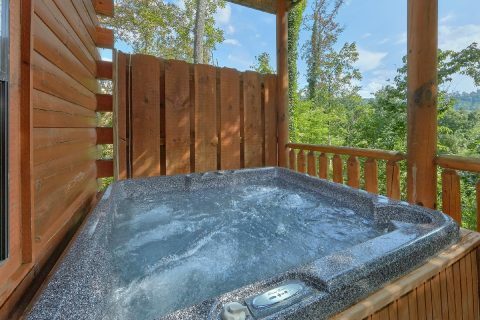 Reserve "Deer To My Heart" in Hidden Springs Resort in the Smoky Mountains today with Cabins USA Gatlinburg and you'll earn a 15% discount on your nightly rate!